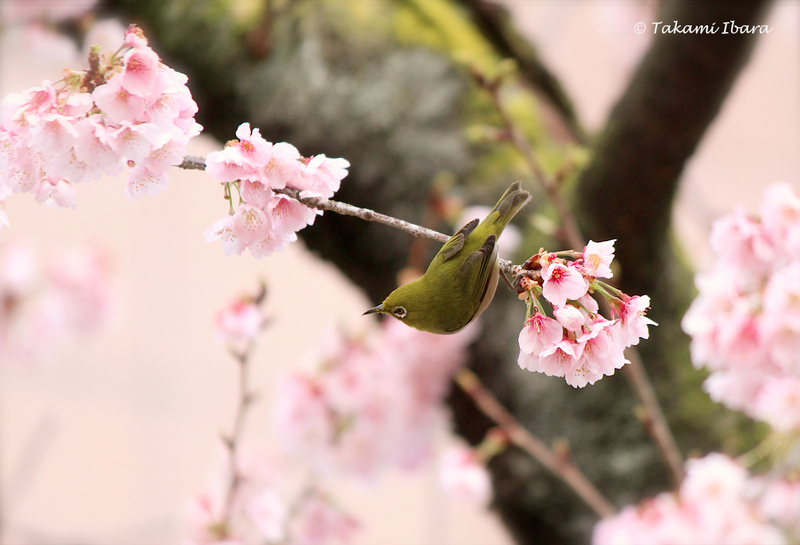 This entry was posted in Birds (鳥), Parks (公園), Photography (写真) and tagged サクラ, メジロ, birds, cherry blossoms, 鳥, japanese white-eye, mejiro, sakura, 桜 by T Ibara Photo. Bookmark the permalink. What a perfect composition. It might be the right time of year to see this combination of bird and blossoms again! Thank you! They are beautiful birds. Thanks for stopping by and leaving your nice comment! You have a unique gift… Your grace is present in every image! Thank you for your kind words and for following my blog! Likewise… I’m inspired by your work! You fooled me my friend, I never saw this until just now. It’s beautiful. You not only beat me with the blossoms (which are awesome when the picture is viewed at large size), but you added the amazing bird that makes my seagull look so mundane. Lol. I should have known I couldn’t win a race against you. Oh well, there’s still next year (I really think you should ship me a few of those little birds though). It really is a beautiful shot Takami. Have a great week-end. Hello my friend! Thanks so much for taking a moment to stop by. Not at all, I didn’t “beat” you at anything! 🙂 I loved your beautiful photos, and I love seagulls too. These birds seem to maintain their natural habitat in east Asia, but they have are also found in Hawaii, USA. I really wish I could send you some of these charming birds. I know you’d appreciate them. I hope to post at least a few more shots of “mejiro” within the next few weeks. I hope you’re having a great weekend too. Beautiful springtide, a lovely bird. I like this, spring is very welcome. I have never seen the “mejiro” before. I’m glad you liked it 🙂 This bird is usually found in east Asia, and is very pretty. I hope to post more photos of this bird in the coming weeks. So very beautiful! The colors perfectly works together. Stunning composition. well, I would love to be in Tokyo one day. I used to stay at the Maronouchi Hotel next to the train station. Small rooms, but so well designed. You know, I prefer sashimi to sushi, but then I was once taken to this small restaurant in the Ginza… The sushi was so brilliant… Ah, the memories! Beautiful picture, thank you for posting it for the rest of us to get to see. I’m so happy you could enjoy it. Thanks for stopping by. Very beautiful. It makes me want to take a deep breath. Stunning, gorgeous – love the cherry blossoms! Thank you Mary! The cherry blossom should start later this month. It will be lovely. Beautiful. Thank you for showing it. Nice work, Takami! Lovely color and (again) good use of the depth of field. You caught the little guy at just the right time for an interesting angle on the branch, too. I had hoped to try and capture a different angle, and this little bird was a natural at modeling 🙂 The lighting was great, which was a big help too. Wonderful pictures of a beautiful early spring. Thank you my friend! It is cold and rainy again. But, there is hope for Spring 🙂 And this small “mejiro” is a beautiful bird. O000 … I love so much spring !!! All the best my dear friend! Thank you Sukanya! Yes, your photos from Japan are lovely. Maybe someday, I’ll have the opportunity to visit your beautiful country. Cherry blossoms, Takami! Gorgeous, gorgeous. I am waiting for our weeping cherry to bloom. It’s spectacular every year but cleaning up the “pink snow” when the blooms fall is a chore! someone commented before me they thought they were cherry blossoms? If so, are they the ones that only last a short time? Oh…what a beautiful photograph, Takami! Spectacular shot with an interesting angle! Thank you, Mr. Hien. It was one of my ‘photo dreams’ to try and capture this beautiful bird and these pretty blossoms from a different angle. Your feedback made my evening! Thank you. It’s amazing how we can come across moments like this, even when out working in the big city. This was taken right near my office in Tokyo. What a beautifully captured moment of happiness! a picture which reconciles with life ! Many thanks Tibara ! QUE PRECIOSIDAD DE FOTOGRAFIA!… PUEDO LLEVARMELA?… LOS CEREZOS ME APASIONAN. Wonderful… We have to wait for about two months to see this Beauty… Wishing you a nice day!